Yesterday I graduated from Harrison Home Health services; an organization I didn’t know existed two months ago and where I learned firsthand that Kitsap County has the greatest group of RN’s and LPN’s on this planet for medical home care. 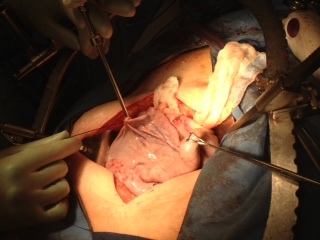 My June 11, 2012 belly tumor operation at the University of Washington was a rip roaring success, thanks to surgeon, .Renata R. Urban, MD and her superb medical team. Six days after the operation I returned home to husband and dogs and into the caring, capable hands of the Harrison Home Health services team. The Harrison Home Health services team followed doctor’s orders exactly – a team care RN or LPN came every three days to change the dressing, including weekends. The vacuum machine hooked to and inside my belly became my best friend 24/7. At 73, I am lucky to be alive. I’ve learned several health lessons along the way since 1997 – the key one being to continue to do whatever I can to promote early detection Spirometry testing for COPD. (Chronic Obstructive Pulmonary Disease) the third leading cause of death behind heart disease and cancer. Getting COPD for many of us means taking a nosedive into the immune system and developing other unpleasant medical conditions. COPD is slow developing, taking about twenty years to develop symptoms enough to tell your doctor. By then usually 50 % of the lungs have flipped from the healthy state – they are destroyed. The fact is I was a healthy physically fit person until I was hospitalized with COPD in 1997. Since then I have gathered one disease after another. 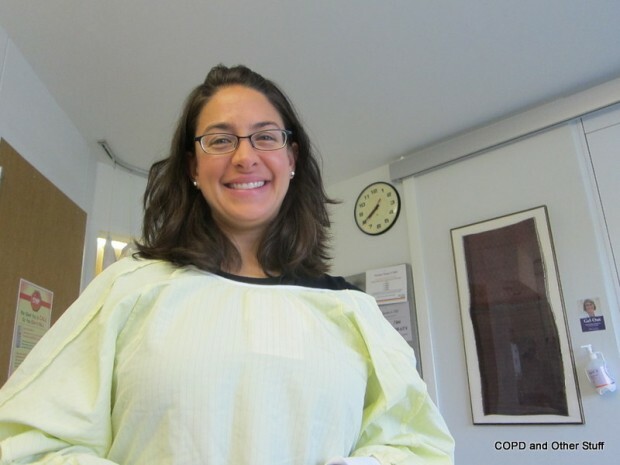 This latest – a fluid filled belly tumor squeezed my lungs making it harder to breathe. It squeezed everything in its path and seemed to shut down my system with a growing hard belly and pain especially in my bone on bone left hip until I reluctantly shuffled from place to place. I canceled and rescheduled doctor appointments thinking the pain would ease with time. As time passed and my ability to get around decreased, Chuck called various agencies in Kitsap County thinking Kitsap County must have public transportation with a lift available for patients trying to get to medical appointments. The problem was I could not lift my left leg to step up and couldn’t use the right leg either – too painful on my left hip. I could not lift it…only pull it after me. We discovered one source in Kitsap but it would cost us over $400. to drive around from Poulsbo through Tacoma to the University of Washington Medical Center for my lung appointment. It felt like something was growing in my belly but the only possibility was impossible so I shrugged it off to imagination. I never imagined a tumor nor mentioned it to my doctors. Funny thing, a complete physical might well have discovered the hard as a rock-growing belly and tumor, had I not sworn off getting physicals. I told my husband we had to make that appointment no matter what happened because I didn’t think I could manage much longer. We HAD to make that appointment and I asked him to get what I thought would help get me into the Suburban. It included tying a rope across the back of the front seats to pull me into the back seat once I shuffled my way up the dog plank and it should balance me into turning to sit down. The plank was supported by the borrowed Poulsbo Wal-Mart milk crates he placed underneath the plank. I shuffled up the plank aided by my walking sticks but the rope failed after I pulled myself inside and let go of one end. The rope wasn’t tied off and I fell forward and twisted with my neck strained across the top of the back seat. At the UW’s parking garage, Chuck ran to get a wheelchair and I pulled myself out of the car and into the chair. He raced us to my appointment on the third floor. I told Dr. Goss about my hard belly and the pain. Thank heavens he looked. When my hard belly wouldn’t budge, Dr. Goss scheduled an x-ray and blood testing. The x-ray showed up black and by the time Chuck wheeled me out of the blood lab, Dr. Goss was there and told us I had a room and that an ultrasound was scheduled in a few hours.. Most medical folks are cool about letting me take photos and allowing me to use them here once I explain about my purpose – COPD and Other Stuff. Its important that people understand that COPD is only the beginning – an opening door to really nasty, painful medical conditions that follow for too many of us. Ask your doctor for an early detection Spirometry test. Please. COPD itself is a long slow smother – not painful. Some of the medical Other Stuff can be really nasty. 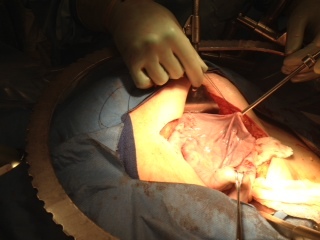 Following are the photos Dr. Urban sent taken during the operation. 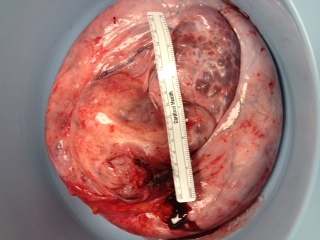 Somehow, I thought of operations as messy and bloody – see the tumor? The pain from the tumor and the 1.5 gallons of black fluid they drained out twice had taken over my life. 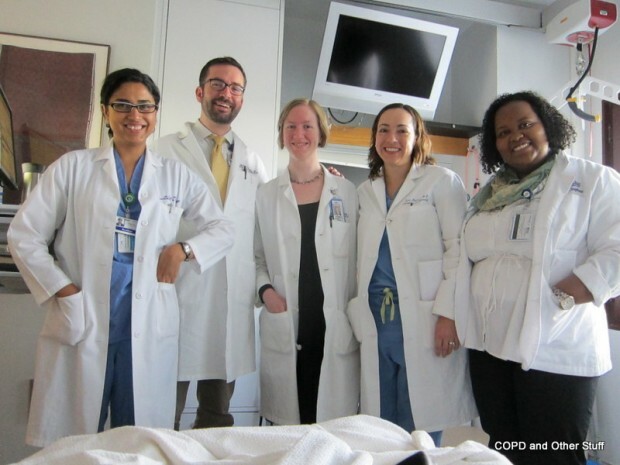 Dr. Urban and team – thanks! I think this was the pain medicine machine that was available to me checked by a helpful nurse. I had super docs with a great patient connection. 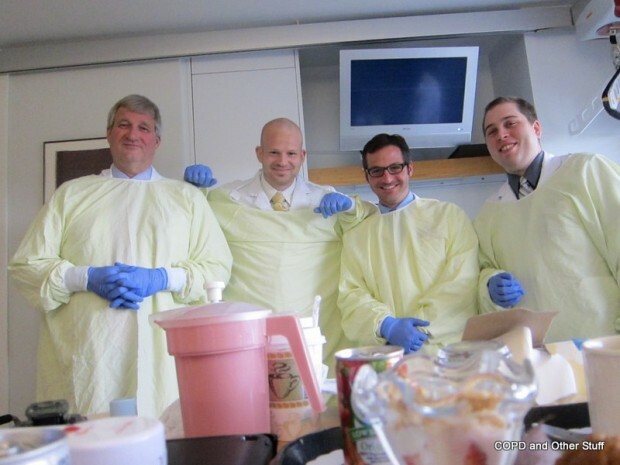 The gowns were worn by everyone who came into my room – MRSA. 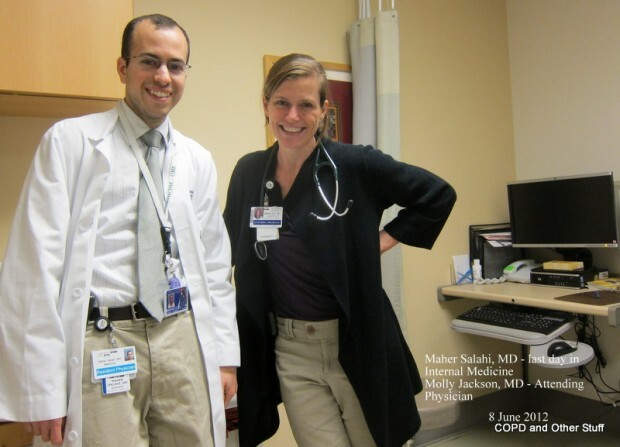 Dr.Salahi will be a wonderful Radiologist if patient rapport matters. He did a super job of making me feel at ease during an intensive pre-patient interview. I am glad for the opportunity to meet him on his last day in Internal Medicine. 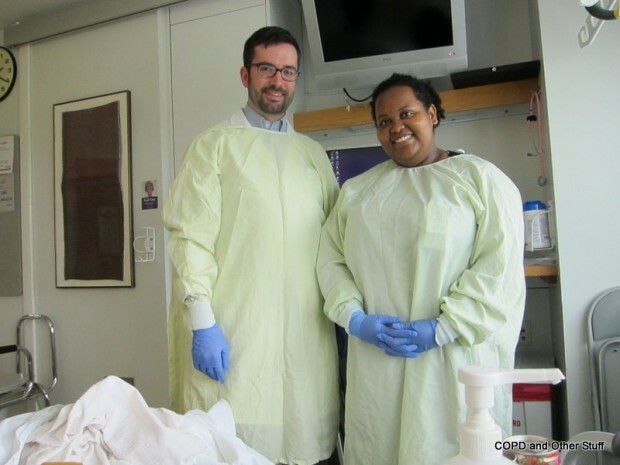 Dr. Jackson was a bright spirit this day and every time she visited after the operation. 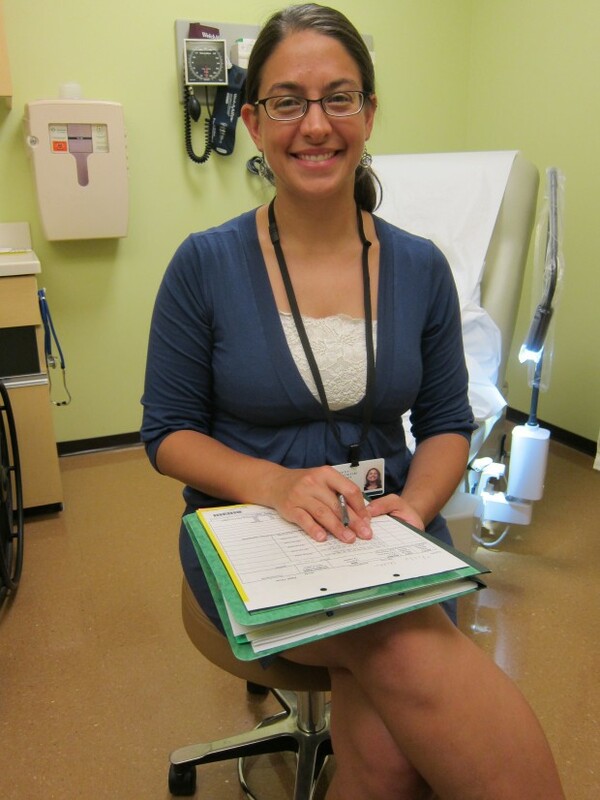 She and the other docs were incredibly verbal, friendly and informative…Just what this patient would order. 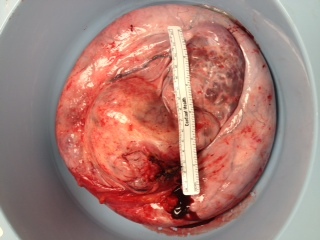 Part 2 of 4 Next time… the machine that acts like a sump pump was inserted into my belly and more ….